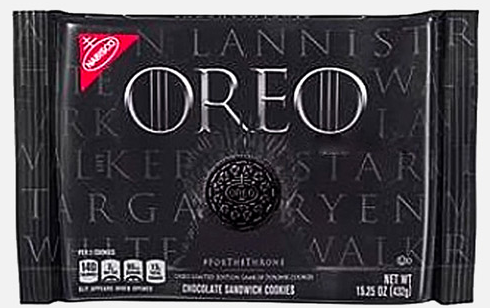 If you love chocolate and you're a big fan of Game of Thrones, then prepare to witness the convergence of two of your favorite things with the release of Game of Thrones-themed Oreos. A foodie Instagram account called candyhunting released a picture of what may be the cookie's packaging. The picture shows the cookie in dark grey packaging, with the names of various noble Houses from the show written across. Anyone can feel like the Mother of Dragons with this Game of Thrones-inspired Easter egg. Available on the Deliveroo website and app from Sunday April 14 until Easter Sunday ( April 21), the eggs are covered in hand-painted scales in homage to the eggs gifted to Daenerys Targaryen at her wedding to Khal Drogo during the very first episode of the show. The eggs have been made using Fairtrade white chocolate, and weigh 1kg each. Costing 80p, the eggs will be available to purchase in London, Manchester and Leeds.